Because of its origin, Capoeira never had unity or a general agreement. The ranking or graduating system follows the same path, as there never existed a ranking system accepted by most of the masters. That means graduation style varies depending on the group’s traditions. The most common modern system uses coloured ropes, called corda or cordão, tied around the waist. Some masters use different systems, or even no system at all. After learning the ginga and developing an understanding of how to esquiva correctly the initiate starts with a raw colourless corda after his/her first batizado. During this time the student must develop the basics of capoeira before being awarded corda amarela. The student has now achieved a pure amarela corda. The colour Yellow represents the student’s achievement of developing a solid base in capoeira. This level sees a return of the white to the student’s corda. The white is to remind the student of their beginnings they should remember to stay humble as their skills develop. The student should also turn their attentions to understanding the music, history and other cultural aspects of Capoeira. The student, after developing a solid base in the game of capoeira, now aims to develop themselves further by improving on their musical abilities, as well as, their abilities in the roda. The colour orange is symbolic of the rising sun. The capoeirista has now demonstrated a solid base in both musicas de capoeira and capoeira itself. A sign of continued development and commitment to capoeira. 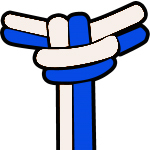 The white reminds them of the importance of foundation where the blue is motivation for the capoeiraista to work toward being well rounded in order to graduate. The student must now look to further their abilities. In order to graduate, the capoeirista must learn to sing and play all instruments while advancing their skills in the roda. The colour azul represents the sky. 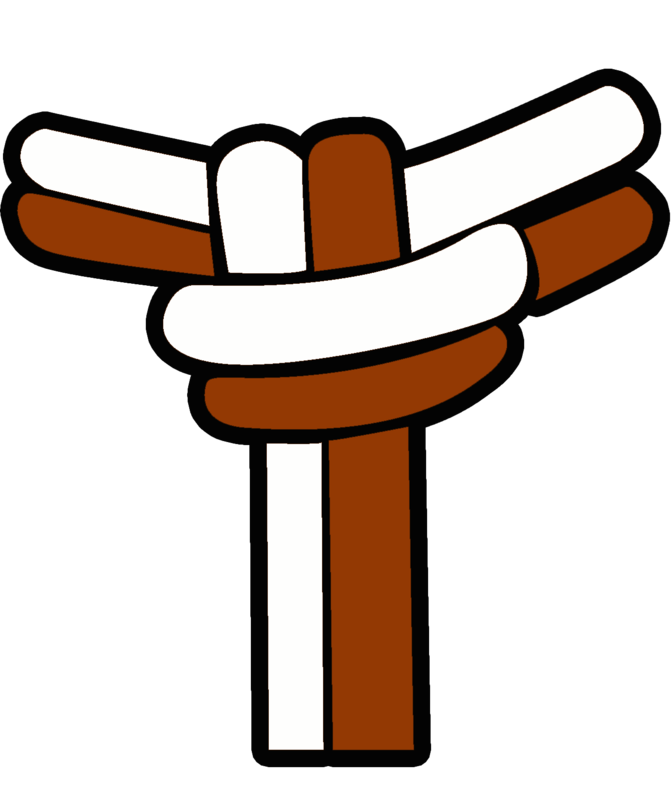 This corda is awarded when a capoeirista can demonstrate their ability not only in the roda, but also their ability to sing while playing all instruments and controlling a roda. The capoeirista is no longer thought of as a student but is considered a graduate. The graduate continues to train in all aspects of capoeira, learning more about the philosophy and history, improving on music while working towards a more advanced game of capoeira. The colour green is symbolic of the forests and vegetation. As the graduate matures the focus begins to be moved away from the individual and onto the group. The graduate welcomes responsibilities and maintains his/her quest for improvement as a capoeirista. While seeking new knowledge to complement his/her teaching skills, the graduate must achieve an advanced standard of game play before advancing to the next graduation. At this stage in the journey the capoeirista is awarded the title Instructor. The capoeirista is now someone who not only is accomplished in the roda, but also has great knowledge of capoeira history, philosophy and tradition which he/she can competently pass on to other capoeiristas. During this stage the instructor must continue developing his/her skills including teaching. He/she must have a very strong game incorporating malicia (deviousness), floreio (embellishment) and o eostilo de grupo (the style of the group) before graduating further. Profesor 1. A sign of continued development and commitment to capoeira. The white reminds them of the importance of foundation where the blue is motivation for the capoeiraista to work toward being well rounded in order to graduate.The colour Brown is symbolic of the earth. The capoeirista is now very experienced in all aspects of capoeira. At this stage, the capoeirista is a strong teacher and can match any style of game that he/she may encounter in the roda. The Professor is capable of organizing events and assists in the running of the group where possible. Profesor 2. A sign of continued development and commitment to capoeira. The white reminds them of the importance of foundation where the blue is motivation for the capoeiraista to work toward being well rounded in order to graduate.The colour Brown is symbolic of the earth. The capoeirista is now very experienced in all aspects of capoeira. At this stage, the capoeirista is a strong teacher and can match any style of game that he/she may encounter in the roda. The Professor is capable of organizing events and assists in the running of the group where possible. At this stage of the journey the capoeirista looks to make his/her capoeira more complete. Fixing any little weaknesses, the Contra Mestre stage is a period of fine tuning. The Contra Mestre stands second only to the Mestre and thus commands such respect. As second in charge, the Contra Mestre intricately understands the group’s strengths and weaknesses and has the ability to run the group without any supervision. The colour of blood; symbolic of the blood shed by the slaves from which this journey of capoeira began. Not only symbolic of the bloodshed of the past, it also relates to the blood that flows through us all. The colour Red represents an understanding of all mankind, its nature and diversity. This stage is the pinnacle of the physical aspect of capoeira. A former student, Instrutor, and Professor, the Mestre has experienced it all and has overcome many obstacles to achieve this graduation. The Mestre develops to the full potential and becomes capable of representing the ideals of the whole group in an honest and impartial manner. The Mestre has now matured and with age seeks a new balance between the physical and philosophical sides of capoeira. This stage of transition sees the end of the physical era and looks towards the future where the mind is stronger than the body. Symbolic of the colour of the diamond. Branca is the highest and most revered and respected corda of all. To graduate to this stage, the capoeirista has dedicated a whole lifetime to capoeira and has indeed become a part of capoeira itself. The Grande Mestre is a source of inspiration to all of his/her students and capoeiristas alike.